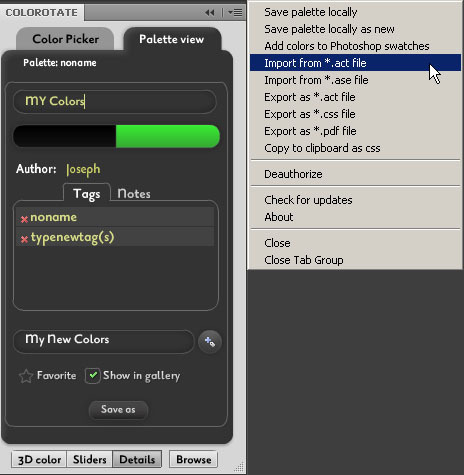 ColoRotate works with many other color systems. You can save palettes in formats such as .act, .ase, .pdf, etc. You can access this feature from the menu at the top right of the plugin. Popular formats for saving the color palettes. .act file (Adobe Color Table) – You can save color tables from optimized images to use with other images and to load color tables created in other applications. Once you load a new color table into an image, the colors in the optimized image are changed to reflect the colors in the new color table. .ase file (Adobe Swatch Exchange) – InDesign, Illustrator, and Photoshop CS2 and CS3 all support the exchange of colors via ASE files. You can easily use colors you’ve created in Illustrator in an InDesign project, or colors you’ve created in Photoshop in an Illustrator project. .pdf file (Portable Document Format) – Saves a simple PDF file to your computer containing your palette information. You can also copy the color palettes onto a clipboard as css.